The whole awkward exchange went uber viral on Twitter of course. 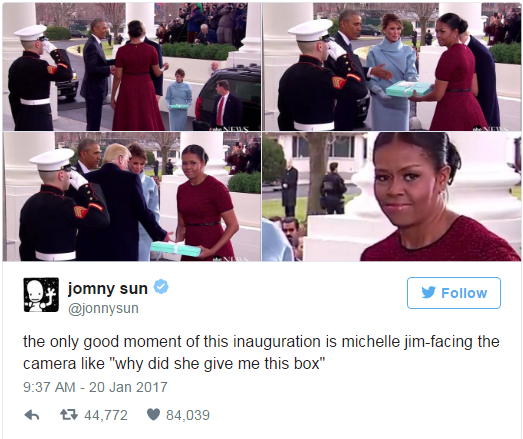 Everything from people wondering what was in the box, to the reaction of Michelle Obama. Graciousness is not in her personal repertoire of actions when around what she perceives to be lesser beings evidently. I thought it was incredibly nice of Melania to bring the gift for Mooch. 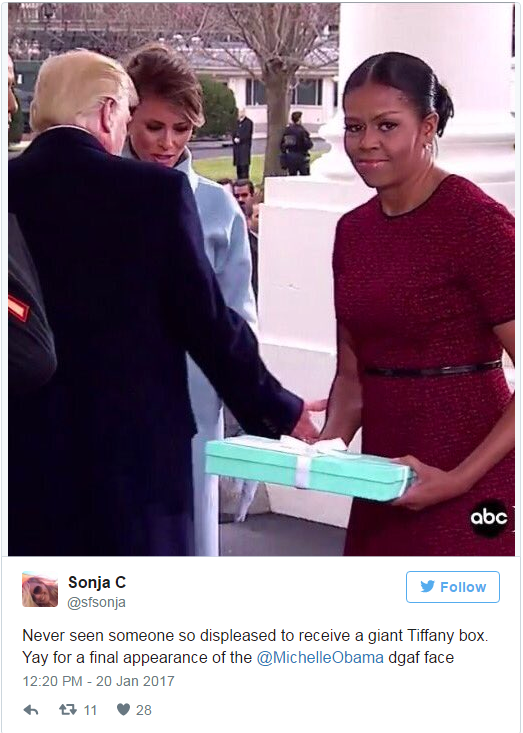 The look on Michelle Obama’s face says it all. It wasn’t sweet surprise… it was more like, man… when can I get out of here! Never underestimate the power of social media to make an otherwise missable moment go viral. 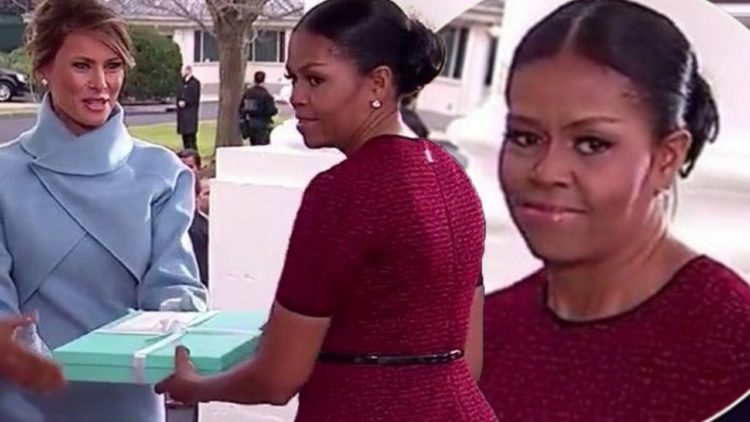 In this case, it was former first lady Michelle Obama’s reaction to a gift that new first lady Melania Trump brought her Friday morning. The new first couple greeted the Obamas at the White House as tradition dictates on Inauguration Day. The two families exchanged pleasantries for a moment before Trump handed over a light-blue Tiffany’s box to Obama. It appeared as though Obama wasn’t prepared to receive a gift, so no one knew exactly where to put it. 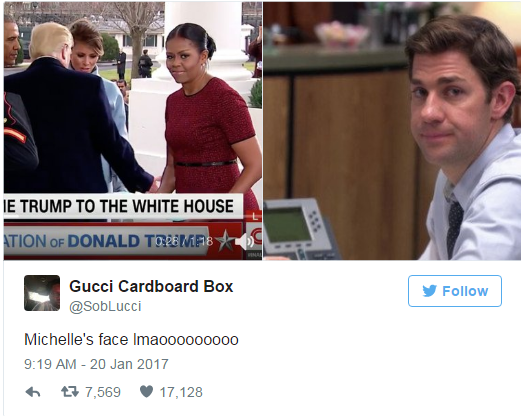 As news coverage focused in on the former first lady’s reaction, Twitter users captured her facial expression and ran with it. It’s unclear what Obama was thinking at the moment, but she definitely looked confused. Hours after she received the gift, many were still wondering what was in the box. The New York Times “investigated” the question Friday and came up empty. ‘Confused’ is not the word I would attribute to that sour mug. You can tell Michelle does not like Melania, that’s evident in her look. Plus, she was embarrassed by the whole exchange. And that is a no-no in Mooch’s world. You know, I really hope that the box contained one of the following: broccoli, the Constitution or a ‘Make America Great Again’ commemorative plate. If it had been anyone else, I would have almost felt sorry for them. Melania showed up looking like the better looking reincarnation of Jackie Kennedy. How do you compete with that? Certainly not the way Mooch did. A very short time ago, these two women were open about their distaste for each other. That hasn’t changed. Just the politics did. So, as Michelle said she had no sympathy for the Trumps on the campaign trail… there’s no sympathy here for this. No class, no grace and boy, am I glad she’s outta there.